Your baby's Christening is an important milestone in their life. Traditionally, the Christening has been a way of welcoming the child into the faith and giving them their official name. Celebrate this important event with one of our beautiful baby Christening gowns or suits. 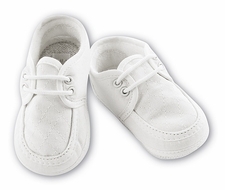 The outfits make excellent keepsakes to commemorate the important day and come in a variety of styles to ensure that you'll find the perfect outfit for your son or daughter for their Christening. 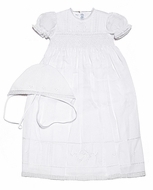 Our baby dedication dresses for girls come in either white or pastel colors. They are available in short sleeve, long sleeve or sleeveless styles to suit your needs and the season. We carry many designs ranging from simple white daygowns to intricate styles adorned in lace and ruffles. For boys we offer a selection of suits and gowns. 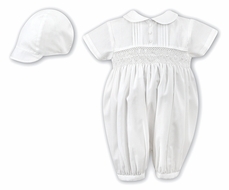 Choose a baby boy dedication outfit in either white or a pale pastel color depending on your needs and preferences. Our suits are available in one or two-piece styles for baby boys of all ages. Choose BestDressedChild.com for the best selection of infant Christening dresses and suits. Our large selection of outfits for boys and girls will help you celebrate this important milestone with style and grace.